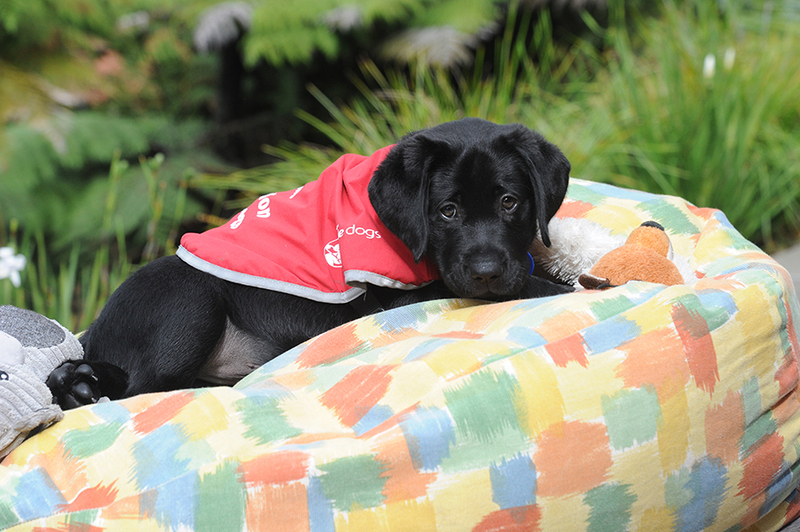 Thank you for your interest in becoming a Blind Foundation Red Puppy Sponsor. Your generosity could make all the difference to New Zealanders who are blind or who have low vision and dream of the confidence, independence and companionship a guide dog brings. If you can’t find the answer to your question here, check out our guide dog facts page – or get in touch with us, we would love to hear from you. How much does Red Puppy Sponsorship cost? Any amount you can give would be greatly appreciated. Most people start giving $20 a month. If you want to change your donation amount, give us a call on 0800 366 283 or email supportercare@blindfoundation.org.nz. How long does Red Puppy Sponsorship last for? There is no fixed amount of time for Red Puppy Sponsorship and we encourage supporters to give for as long as they wish. Donations can be cancelled at any time. Where do my Red Puppy Sponsorship donations go to? You can choose to only support guide dogs with your monthly donation, or provide help where it’s most needed. Donations to guide dogs contribute to the cost of breeding and training all of the puppies currently going through the programme, as well as the continued service support needed for a blind or low vision person preparing for a guide dog. However, losing your sight can turn your life upside down, and people often need significant practical and emotional support to restore their confidence and relearn everyday tasks before they’re ready for a guide dog. Donating wherever it is most needed will help us provide support to people who are blind or low vision in every aspect of their life. Can I gift a sponsorship to a friend or family member? Yes, you can gift a sponsorship. The person who has been gifted the sponsorship will receive a welcome pack, a photo of a puppy in a frame plus a puppy sponsor’s handbook. As the giftee, you will receive an acknowledgement letter at the start of the sponsorship and a tax receipt at the end of the tax year. Do I get to choose the puppy I sponsor? Red Puppy Sponsorship contributes to the cost of breeding and training all of the puppies currently going through the programme, as well as the continued service support needed for a blind or low vision person preparing for a guide dog. This means you are not sponsoring just one puppy. Each year we feature one puppy as our “Pupstar”, who gets to represent all puppies going through training. When you sign up you will receive a framed picture of this puppy your welcome pack, along with the Red Puppy Sponsorship handbook. We also send out regular updates on the puppies in our Pupdate newsletter. Can I sponsor two puppies? Red Puppy Sponsorship donations go towards all services, which means so you are supporting all guide dog puppies in training, not any two in particular. However, an increase in your donation would help to provide more much-needed guide dogs for blind New Zealanders and would be greatly appreciated. Your monthly donations can be cancelled at any time. Call us on 0800 366 283 or email supportercare@blindfoundation.org.nz with your contact information, including full name, postal address, and payment method so we can stop any further donations. Any donations over $5 are tax deductible. Unless requested otherwise we will send you a tax receipt for your cumulative gifts at the end of the tax year. Why does my friend have a photo of the same puppy? Each year we have a new ‘Pupstar’ who is the puppy face of the programme, and represents all the puppies going through guide dog training. Through the pupdates that you will receive updates on many more puppies going through the programme at the same time. Can I meet the puppy? Unfortunately, we aren’t able to facilitate Red Puppy Sponsors meeting the puppy. Each puppy is just starting its life as a guide dog and will need to concentrate fully on its training if it is to succeed. We will provide you with regular updates of puppies in the programme, in our newsletter, Pupdate. You are also welcome to visit the Guide Dog Centre in Auckland where the puppies spend the first 7 weeks of their lives. Visits are by appointment only, please phone 09 269 0400 for more information. Can I meet the blind person matched with a guide dog? To protect the privacy of the people we work with we aren’t able to directly communicate with the blind or low vision person matched with a guide dog, or the volunteer puppy raiser. We do provide regular updates of the guide dog puppies in our newsletter, Pupdate. You are also able to book an appointment to visit the Guide Dog Centre in Auckland where the puppies spend the first 7 weeks of their lives. What happens to the puppies that don’t make the grade? When it becomes clear that a puppy is not suited to becoming a guide dog, we first try to find a new career for them. This could mean moving them on to another organisation that trains assistance or mobility dogs. If that option is not appropriate, or if the puppy has been withdrawn for reasons that would make them unsuitable for any type of working dog (e.g. health concerns), they go up for adoption. First priority for adoption goes to any volunteers involved with the puppies life. After that, they will become available to people on our adoption register. Read more about our guide dog adoption procedure here. Sign up now using our online donation form. Choose a monthly donation amount that suits you.